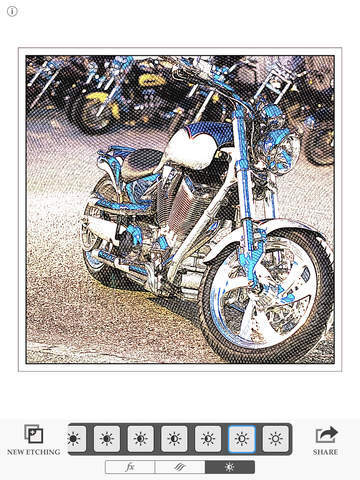 Instantly create beautiful etched illustrations from any photo! Experiment with twelve stunning styles you can tweak to fit your image perfectly — it's easy and fun to turn your photo into a unique work of art. Once you have created your beautiful etching, share it with your friends on Facebook, Twitter, Instagram and more. 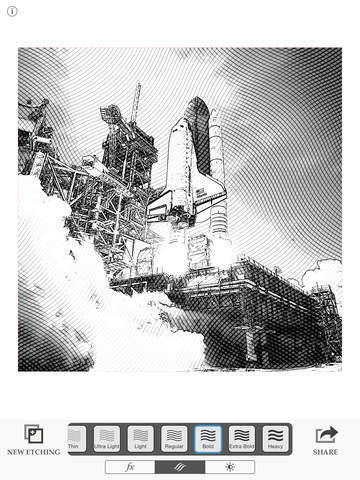 Etchings also plays nicely with other apps: you can import images directly into Etchings and export them in high-resolution (up to 3300x3300) to the camera roll or your (second) favourite photo app. Find just the right look from the dozens of combinations in Etchings. 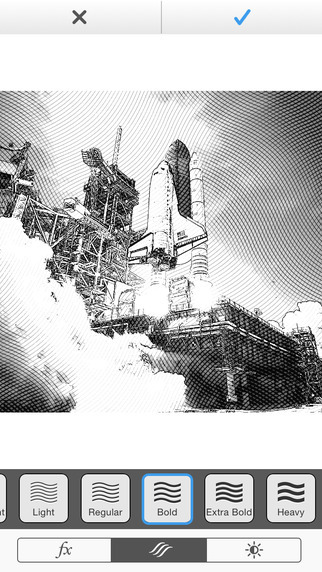 Try the "Classic" filter to create a timeless black-and-white illustration with amazing detail or, if you are looking for a little fun, try the "Spectrum" filter to create an extra-vibrant work of art. 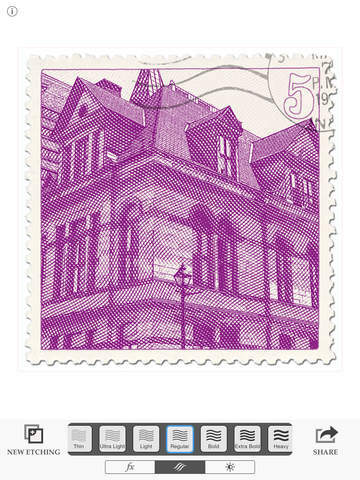 Why not immortalize your friends on some faux money or send them first-class with the "Air Mail" postage stamp filter. For even more options, check out the Florence FX Pack! From the striking colorful "Alice" filter to the funky rainbow "Sorbet" filter, you can unlock six more hand-crafted effects for just 99 cents (or local equivalent). Check out www.etchingsapp.com or follow @etchingsapp on Instagram and Twitter for some inspirational samples. You can search for #etchings to see the beautiful results created by artists from around the globe. Note: High resolution output is limited to 1600x1660 on iPhone 3GS, iPod touch 4th generation, and iPad 1st generation. All other devices support resolutions up to 3300x3300. Other apps by MindSea Development Inc.